Please join us for the grand opening! BUTTER projects is a new studio and gallery space founded by Kelly Frank and Alison Wong. 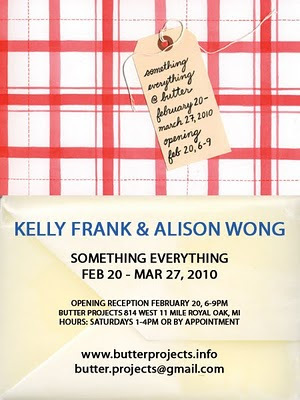 The premier exhibition SOMETHING EVERYTHING features collaborative works by Frank and Wong. The exhibition theme stems from the relationship between the two artist, their work and vision for the space. Essential elements are used to discuss the process and development of art and life. Included in the show is the installation, Two for Ten, which uses brown bags to reference the building's history as a market. Each bag includes a mystery work of art on sale for $5 each to benefit future programming at BUTTER projects. Don't miss your chance to purchase limited edition pieces from the installation!